It’s a tradition of the Board for Certification of Genealogists®, its way to say thank you to the Family History Library in Salt Lake City and its staff for all of the work it does and they do to support genealogical research. 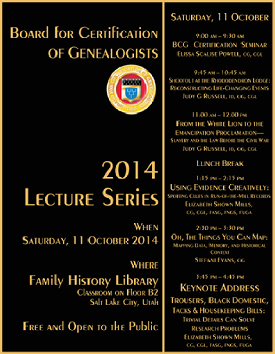 Every year, just before the annual fall meeting of the BCG Board of Trustees, BCG presents a free lecture series — free and open to the public — at the Family History Library. And that lecture series takes place on October 11th, just two weeks from tomorrow, in the classroom on the B2 floor of the Family History Library. The series begins with an overview of the BCG certification process by Elissa Scalise Powell, CG, CGL, at 9 a.m. and continues with five presentations by three lecturers who hold credentials as Certified Genealogists from BCG and who serve as members of the BCG Board. If you’re anywhere in the area… or if you’re looking for one last excuse to get on a plane and head for Salt Lake City for some research… this is a series not to be missed. Come join us for this free, public lecture series — a thank you to the FHL. I am so looking forward to this! Thanks for posting the schedule. Hi, I just wanted to let you know that I nominated you for the One Lovely Blog Award. I really enjoy your blog and find it both helpful and interesting. Our shared interest in genealogy drew me to the blog, and I’ve learned a great deal from your research techniques and insights. Thanks, Amy. I wish I had time to respond properly to this and other similar nominations but being on the road as much as I am all I can do is say thank you! Every year, same time frame, Ginny. Next year, then! I’m afraid not, Emily: these are always a “gift” from BCG to the Family History Library community and, now, anyone from the public who can make it to the lectures in person.